I am pleased to announce that I’ve finished the ninth and final book of the Wind of Destiny series. I don’t know exactly when I began writing book one, A Hero’s Calling, but if I had to guess I’d say the journey began around August of 2015. It’s been three long years, but enjoyable to experience the characters and their stories. Through stops and starts, and periods of focusing on other projects, I steadily wrote the books, one by one. I am so thankful to the readers who shared the journey with me. Now, it has come to an end, like all journeys have to, eventually. I have released a new book. Download a sample and check it out! Creatures of shadow are crawling through the land of Eloesus… they seek one man above all else: Theron, upstanding citizen, master swordsman, and veteran of many wars. As he flees, doom is falling over the land: clouds of fire hover over the ancient city of Thenai and infernal names not spoken in thousands of years thunder from the mountaintops. A hero is needed. A wind of destiny is blowing, yet Theron is one false step from death. I’ve had questions about various aspects of my world before. I wanted to point out a website where I put all my notes, written up as entries, as well as super illustrations that I have commissioned. That part of my world is featured both in Fell Winter and Tide of War. There are certain other entries with illustrations, but not many… yet. Please do check it out! Now, three novels – Fell Winter, High Queen, and Dragon’s Son – are available in print, complete with maps. They have distinctive golden spines that I’m very proud of. You can order them at Amazon or Barnes and Noble. You can also order signed copies, as seen on the fancy new tab. I am currently working with a wonderful illustrator to create some black and white sketches for the Vampire Origins novellas. 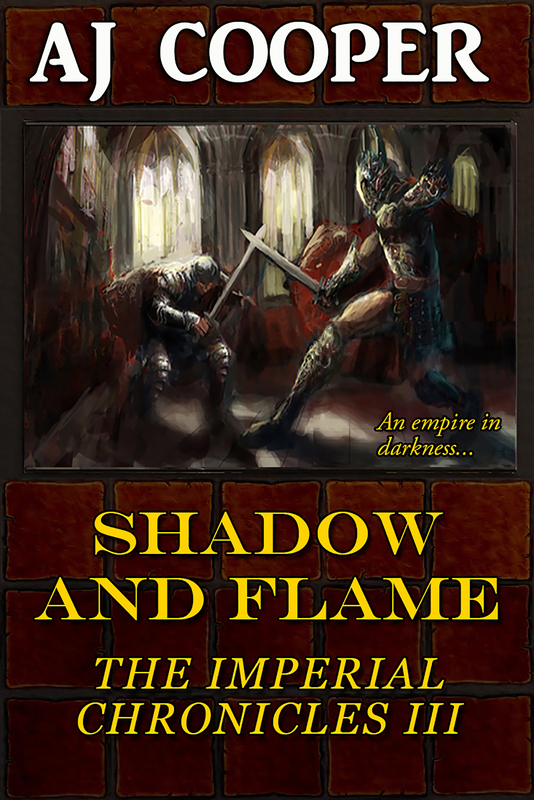 The third installment in the Imperial Chronicles has just been released. You can find it now on Amazon and Kobo. Other ereading sites will have it soon. Until then, head to Smashwords. The Empire has reached its zenith of power and prosperity, but things are rarely as they seem. As shadow spreads across the world, the Revered Order of Hunters scours the provinces for demon shrines and their fiendish worshipers, all while an eerie silence south of the Imperial border hints of a gathering storm. The emperor Severus struggles to maintain the recent peace and harmony, though he knows the growing dark touches all strata of society, from the highest official to the lowliest street actor, and no one is worthy of trust. Far away, unbeknownst to the southron King of Kings and the Imperial government, the brother-sister heirs to the Red Throne of Haroon lay in hiding. But as a dark faith spreads by the sword across the Southern World, plunging ancient nations into chaos, not even well-born monarchs will escape these trials of SHADOW AND FLAME. The third novel of the Imperial Chronicles. To start at the beginning, read Unconquered Son and the sequel, Red Empire. Like most books I am happy with, I sat down and wrote this straight through. I took a lot of inspiration from both current events and from the ancient Greco-Roman world, as well as the parallels between the two. None of my readers so far have picked up on these, but I’m hopeful that one day people will. I have two more novels in this series planned (it will have five installments) with one due for November/early December and another set for January or mid-February. Thanks to all my blog readers and those who have gone on to read my books. Just so you know, you can read a free book here. “Unconquered Son” begins the Imperial Chronicles, a series of related stand-alone novels. You will be able to read them in any order, though reading them in sequence will give a sense of continuity. The Empire teeters on the brink of collapse. A hedonistic teen assumes the throne under false pretenses while a slave rebellion erupts in the north. The southern King of Kings, sensing weakness, sets his eyes on his vulnerable foe. In the midst of the growing tumult, a young man from the Empire’s hinterlands grudgingly heads to Imperial City. There, Claudio-Valens sees firsthand the weak, treasonous Imperial Council that aids foreign enemies, and finds himself at the center of the fight to save the country he loves. What follows is a tale of desert queens and legionaries, of mad girls with great gifts and scheming highborn ladies, of gods both human and divine, that will forever transform the world they know. Buy for $5.99 on Amazon, Kobo, Nook, or Smashwords. Over the past two months, I’ve sat on this novel (not literally, of course.) Mostly, I procrastinated on writing the synopsis and query letter. I talked with my writer friends on Codex and Odyssey et al. I realized that, should I decide to submit it to publishers, I may as well have it available for the public to read. I’m thrilled to announce that I will be publishing “Fell Winter” — a novel of 40,000 words (160 printed pages) — soon . The next book, “High Queen of Badelgard,” will be available by early December this year. An evil not seen in hundreds of years has awoken in the highland nation of Badelgard. The Ulfr – the original inhabitants of the land whose evil was matched only by their power over death – stir from their barrows. The dead walk again at the command of an Ulfr witch. The fate of the High King and the possession of the High Throne grow more and more uncertain. Tensions flare between the lowborn commoners and the highborn descendants of the Seven Wardens. In the middle of it all, the lowborn musician Brand Gutlaffson is thrust into a perilous chase thanks to the foolish decisions of his friend, the warrior Gunnar Whoreson. Their midnight flight takes them to the accursed land of Blackfold, where the ancient Ulfr goddess waits for Her awakening. The cold begins to set in. But there is more to fear than darkness and snow in this FELL WINTER. This 40,000-word novel begins “The Ulfr Crisis” trilogy.